Dental Implants have caused a revolutionary change in dentistry. Implants are man-made replacements for missing teeth and can be used instead of bridgework. They are positioned into the bone of the jaw and behave exactly like roots and even bond naturally with the jawbone. This action is known as osseointegration. A porcelain crown is then fitted on top to match with the rest of your smile. Placing an implant is a very gentle procedure and is usually done with local anaesthetic, much like when having a filling. After dental implant placement most patients experience minor discomfort after the anaesthesia has worn off and this is usually controlled by simple painkillers. The level of discomfort is quite different from patient to patient, but it's unusual to have significant problems. Missing teeth can be replaced using implants and the latest aesthetic bridgework and dentures. Sunny Smiles will endeavour to provide you with the treatment which is most appropriate for your needs. A dental implant is a metal rod that is placed in the jawbone to hold a false tooth in place. They are usually made of titanium, a metal that is well-tolerated by the body. Over several months, the bone fuses with the metal implant. A small attachment is left protruding through the gum, and dentures or bridges can be screwed or clipped onto this attachment. One implant can support one or more false teeth. Five or six implants are usually used to replace all the teeth in the jaw. There are a number of reasons why you may choose to have implants. Implants are an alternative to conventional bridges and partial dentures. If you find that your denture moves around a lot in your mouth, implants may help to anchor the denture in place. When you lose teeth, your jawbone may start to shrink. Implants can help slow down this process. We may recommend using implants to support a bridge rather than affecting healthy teeth either side of a gap. Implants are not appropriate for everyone. You need to be in good general health, have healthy gums and your jawbone must be thick enough for the implant. There are, however, surgical procedures to increase the amount of bone in your jaw. Implants are more likely to be successful if you don't smoke. Our dentist will advise you whether implants are a suitable treatment for you. Implants may not be an option for people with chronic conditions such as poorly-controlled diabetes or osteoporosis. This is because the jaw may not heal properly and the implants may not fuse with the jawbone. If implants are not suitable for you, your dentist will discuss alternative treatments with you. You may choose to accept the space where a tooth is missing and do nothing. The alternatives to implants are dentures or bridges. Dentures - a denture is a removable replacement for a few missing teeth (partial denture) or a whole set of teeth (complete dentures). There are a variety of types of dentures, but they usually include a metal and/or acrylic (plastic) framework with plastic or porcelain artificial teeth. Dentures may sometimes become loose, making it difficult to eat and speak. One or more implants can be fitted to help support a denture. Bridges: a bridge consists of artificial teeth cemented onto adjacent natural teeth. Our dentists are qualified to perform your dental implant surgery. You may need to have an X-ray or a CT scan so that the dentist can check the thickness of your jawbone and the position of other structures in your mouth. A CT scan uses X-rays to build up a three-dimensional picture of your teeth and mouth. Implant surgery is usually carried out under local anaesthesia in which case your mouth and the area around your mouth will be numb but you will stay awake. In some cases, sedation may be available; this relieves anxiety and causes temporary relaxation without putting you to sleep. For some patients, the procedure may be carried out under general anaesthesia which means that you will be asleep throughout the procedure and will also feel no pain. A cut will be made in the gum and a hole will be made in the jawbone. The implant will be fitted into this hole. Our dentist may place the implant into the tooth socket directly after your tooth has been taken out and replace the root of the natural tooth straight away. Alternatively the implant can be placed into the jawbone long after the tooth has been removed and the socket has healed. 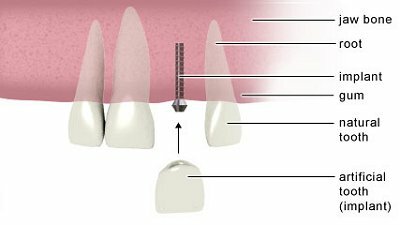 Once the implant is in place, the gum will be stitched over it and the area will be left to heal. Stitches are usually removed after about a week. Sometimes our dentist can attach artificial teeth on the same day you have the implant. Usually, however, you will need to wait for between three and six months while your mouth heals before it can be fitted. The healing process allows time for your jawbone to fuse securely with the surface of the implant. While your mouth is healing, your dentist may fit a temporary bridge or partial denture so you can't see the spaces between your remaining teeth. If you have complete dentures, they can generally be adjusted so that you can wear them throughout this period. After your mouth has healed, you may need to have a second, smaller surgical procedure to uncover the gum over the top of the implant. Your dentist will then fit your artificial teeth onto the implant. The teeth may be fixed permanently or be attached in a way that allows you remove them for cleaning. Your dentist will ensure that they fit properly, match your other teeth and feel comfortable. Dental implants have a high success rate. The surgery is commonly performed and is generally safe. However, in order to make an informed decision and give your consent, you need to be aware of the possible side-effects and the risk of complications of this procedure. Side-effects are the unwanted but mostly temporary effects of a procedure. Examples of side-effects include some swelling and discomfort around the implant area. If you have any discomfort, take an over-the-counter painkiller such as paracetamol or ibuprofen. Follow the instructions in the patient information leaflet that comes with the medicine and ask your pharmacist for advice about whether it's suitable for your individual circumstances. The chance of complications depends on the type of procedure you are having and factors such as your general health. Complications can occur during or after the procedure. Most people aren't affected. The complications of any surgical procedure can include an unexpected reaction to the anaesthetic or infection. You are likely to be prescribed antibiotics and an antiseptic mouthwash to reduce the risk of your implant becoming infected. Your lower jaw contains nerves which supply feeling to your tongue, chin, lower lip and lower teeth. In a small number of people, the nerves in the lower jaw can become bruised during implant surgery. This may cause a tingling or numb feeling in your tongue, chin or lip. This is usually temporary, but in a small number of people this altered sensation may be permanent. On very rare occasions, the jawbone doesn't fuse with the implant properly and the implant may become loose. If this happens our dentist will need to remove the failed implant and wait until the bone has healed before attempting to place another implant. Most implants are very successful, but the crowns, bridges and dentures that the implants support can be damaged just like normal teeth - for example, as a result of an accident, break or chip. The crowns, bridges or dentures are generally easily replaced, providing the implant underneath isn't damaged. Implants can last for many years but maintaining good oral hygiene is vital. To help maintain your implants you may have to spend more time than you did in the past thoroughly brushing and flossing your teeth. Our dentist will give you specific advice on caring for your implants. He or she will ask you to attend regular check-ups, and will usually take X-ray images each year to check your implants are still secure. This is how we put the smile back on this attractive young lady's face. The missing teeth were carefully reconstructed and her smile re-constructed.